Salvation has come to us; from thee is salvation. Thou art wisdom, thou knowledge; thou art truthfulness. On account of thee is life; from thee is life. On account of thee is mind; from thee is mind. thou a triple power, thou threefold. O, Lady Sofia, Jana of Intelligence, Intuition and Wisdom, be with us. May the Pure Stream of your Virtues flow within me, in this world and in all the worlds to come. Winter is the Season ruled over by one of the Janae of the Four-fold Earth. These govern the four cardinal directions and their corresponding Elements and Seasons and therefore, they are known as the Janae of the four-fold Earth. Jana Madria Sage is the Guardian of North and Air and Guardian of the corresponding Season of Winter. And so, today is the Feast of the Jana, Madria Sage. On this, her feast day, time may be spent in quiet prayer, maybe a Janae mantra rosary or contemplation in Her honor. Lady Sage may also be celebrated with the Liturgy (priestesses) or the Rite of Sacrifice (devotees), which may also be celebrated this coming Sunday. Everyone celebrates the feast days of the Janati differently. Some offer flowers and incense, feast foods and drink. Others incorporate some of Their correspondences into the day in the way they decorate, in the foods they choose or in the colors they wear. Others might incorporate special crafts or rituals, but usually these are reserved for our High Holy Days. Download a colouring page of Sapientia, (sah-pee-ehn-tee-ah), whose name means “feminine wisdom” in Latin, who is the archetype of wisdom. So for Madria Sage’s feast day, some devotees might wear the color yellow in Her honor. They might use a yellow tablecloth and place vases of yellow flowers on the home altar or shrine and around the hestia (sacred blessed home). They might burn the incenses that are sacred to her and decorate with images of owls and other items symbolic of Air such as feathers and bells. is an ancient archetype of feminine wisdom. prudent counsel in all my affairs. (2000-1000 B.C.). Capital of modern Greece situated in Attica. It was named after the goddess Athene. Zeus had swallowed his consort, Metis, on learning that she would soon bear a child who would rule the gods. absorbed wisdom (Metis), and from this wisdom came the knowledge from which the arts (Athene) developed. Mnemosyne (mim-ohs-sen-ee) was the Titaness of memory and remembrance and the inventress of language and words. Come eat of my bread and drink of the wine I have mixed. Wisdom of God, Sophia. “Sophia (soh-fee-ah or soh-fi-ah) means “wisdom” in Greek, and to the Gnostics of two millennia ago, Sophia was the Holy Spirit and the third person of the Trinity. She is considered by the Gnostics to be the creator of the physical universe. Certain Gnostic texts call the Holy Spirit “God the Mother”. apply your heart to Understanding. The name Hokmah comes from an Egyptian goddess called Heq-ma’a, or Hek-ma’at – a goddess of – you guessed it – wisdom and deep mysteries. Heq-ma’a is originally mentioned in the Egyptian Book of the Dead, a scripture which predates the entire Bible by centuries. Heq-ma’a’s name loosely translates as “Underworld Mother of Wisdom, Law, and Words of Power.” Heq is translated as “intelligence,” or “knowledge”. From heq we get the word “hex” meaning magic words of power. Heq-ma’a’s name became Hokmah. And words like Hagia (holy) and hag (wisewoman, holy woman) come from the heq part of her name. She evidently scared the heck out of the church authorities because they demonized her. The word Hag now has a negative connotation and is associated with witch. One of the oldest Greek Goddesses, Hecate, also gets her name directly from this Egyptian goddess. The illustration is Sophia as Hokmah, that supposedly masculine sphere on the Tree of Life. She is obviously female and is adeptly wielding the fires of creation. Have you noticed since she’s been on the screen she’s been looking you in the eye, as if to say, I’m trying to tell you something, he that hath an eye let him see? Well, her secret message is her name. See how the balls in her hands look like spheres on the Tree of Life? They are. She’s holding them in the positions of her two names, Wisdom and Glory, Sophia and Shekinah. We just saw that her Egyptian name means Underworld Mother of Wisdom. See how she is rooted in the underworld, coming up from a grave? Earth science has proven volcanoes go hand in hand with planetary formation. Sophia is said to have created the world. Chokmah (pronounced hok-mah) is the second stage in the process of manifestation, and the first actual “manifestation” of energy itself. The “wisdom” of Chokhmah also implies the ability to look deeply at some aspect of reality and abstract its conceptual essence till one succeeds in uncovering its underlying axiomatic truth. These seeds of truth can then be conveyed to the companion power of Binah for the sake of intellectual analysis and development. Chokhmah is the primary (“beginning”) force in the creative process, Creativity, as it is said: “You have made them all with Chokhmah.” (Psalms 104:24) The first word of the Torah in Genesis, Breishit means “In the beginning (God created the heavens and the earth)”, is translated (Targum Yonatan) as “With Chokhmah (God created…). “It is believed that goddess Saraswati endows human beings with the powers of speech, wisdom and learning. She has four hands representing four aspects of human personality in learning: mind, intellect, alertness and ego. In visual representations, she has sacred scriptures in one hand and a lotus–the symbol of true knowledge–in the opposite hand. Traditionally, the figure of prudence is shown with a snake, a bird and a torch. Maybe: “…wise as serpents and harmless as doves.” Matthew 10:16b A torch for prudential illumination. Sapientia (sah-pee-ehn-tee-ah), whose name means “feminine wisdom” in Latin, is the archetype of wisdom. Sapientia has been termed the “goddess of the Bible” by some scholars, indicating the presence of the Divine Feminine in monotheism. She was ackowledged up until medieval times but has been forgotten with the passage of time. In fact, she thrived as a hidden goddess of philosophical inquiry between the fifth and fifteenth centuries at a time when the sacred feminine was considered heresy. O come, o come Wisdom from on high – You who were, who are and who is. only of our country, only of our religion, only of our historical moment. Foods for the feast meal might tend to be airy and light and well, yellow such as yellow vegetables and jello salads. Light and airy (for the Element of Air over which She rules) foods and beverages such as angel food cake, salads, champagne, white wine or white grape juice, light soups, rice, white beans, apples, pears might be an important part of the feast. All these ideas make the feast meal festive and fun. Stelladi / Star day / Wednesday. Sometimes, I choose a Virtue that I know I’m going to need that day. I call on Her help with the Virtue of Wisdom whenever I must make an important decision about the Janite Tradition or when writing articles or counseling someone in need. I am slowly learning to pay closer attention to my intuition. For example, so often, as I was leaving the house, I would see something and my inner voice was telling me I should take it with me, but my logical side would dismiss it as not being necessary. And, nine times out of ten, it ended up that I needed the item. When I started my new job, I prayed for the Virtue of Intelligence to see me through. This is helpful when studying for and taking tests or in a zillion other areas. There are two types of Intelligence, the IQ and the EQ. EQ is Emotional Intelligence and is just as important as the Intelligence Quotient. There are so many areas where Madria Sage may help us. I love consciously surrounding myself with the Presence of the Janae during my Aurora Rite each morning. I feel like they are with me all day when I do this. And when I try to connect in a special way with the Jana of the day, I find I come to experience Them and know Them on an intimate, soul level. O, Madria Sage, we thank You for this day and for all Your blessings and benefits. Be with us. May Our Lady bless you, Blessed is She. With additional information from Madrina Sophia. As we faced South and bid farewell to the Noontide of Summer, during which we honored the Celestial Mother as the Rose of Joy, we expressed gratefulness for all its blessings and benefits. Now, as the Wheel spins yet again, we turn to the West and enter the time when we honor the Twilight of Autumn; a time when we revere the Holy Mother as the Apple of Wisdom. Ruled over by Madria Thema, whose Feast Day is 1 Abalon/Sept. 5, Fall is the time of year when the last of the harvest is gathered and we prepare our hestias (homes consecrated to Dea) and our souls for the deep darkness of winter. Like Spring, Fall is a time between times; a time of transition from one state of being to another. Where Spring marks new beginnings, Fall marks a time of endings; a time when those aspects of our lives which no longer serve us are cast off in order to plant new seeds of Wisdom and Grace within our souls. These seeds will germinate in our inner gardens through the Winter in order to better serve us at the Aurora (Dawn) of Spring. It is a time to examine our lives and see where we are headed. We need to ask ourselves if our current Path, our goals and our life events are the ones which are true to our souls, to our higher selves. It is often said that where we are in our lives as we approach death is where we will begin our new lives in our next incarnation. I sometimes ponder what kind of person I would like to be in my next life and then begin to work on those goals. I would like to be kinder and more harmonious. I would like to attain an inner serenity that I have not had in this life. I wish to be faithful to Dea. I want to strive to remember that my moods and words affect those around me. These are some of the inner seeds of Wisdom that I wish to plant in my soul-garden. During this time, I have realized that there is much that I must let go in order for the seeds that I have planted to grow and to be nourished. I must take care that these seeds will not be destroyed by the choking weeds of strife and disharmony. It’s a time for me to concentrate on living my Faith, caring for my family and for being true to my True Self. Though eternity is out of time, here, in manifest creation, time is considered sacred because each moment of life is sacred. Each hour, each day, each month and each Season of life is holy and is meant to be lived to its fullest with gratitude. Even during times of trial and suffering, there is always something to be found for which we may be grateful and Our Holy Mother and the Great Janati are always ready to assist us. I am grateful for my Faith and for my family. The Twilight time of Autumn, which is associated with the Element of Water in our Tradition, is a time of intuition and introspection. It is a time to assess our emotions and to search out those areas of our lives where we may foster greater Order and Harmony. 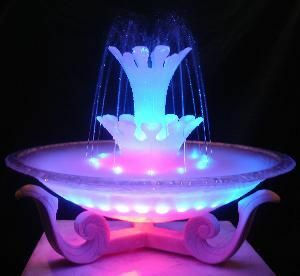 Once our souls are ruled by Harmony, this Grace, which stems from the Fountain of Madria Thema, will flow within us, through this world and in all the worlds to come, as our beautiful Silver Star of the Waters prayer so aptly states. 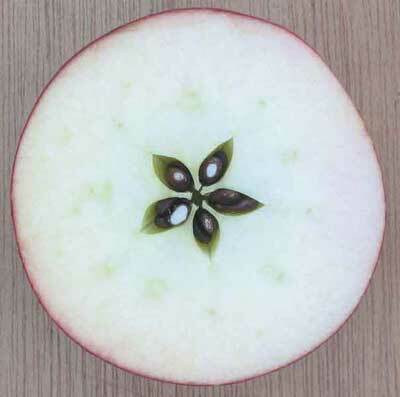 The Apple or Abal from the Old Welsh, is the symbol for this Season containing within, the five seeds of wisdom. I bless and wear an apple pendant during this Season in honor of Our Lady, Apple of Wisdom. 1. From the branch of a tree, the Daughter plucked an apple, and She split the apple in two halves, so that the five-pointed star formed by its seeds might be seen. 2. Then She removed the seed representing the topmost point, and held it in the palm of Her hand. And She spoke, saying: 3. 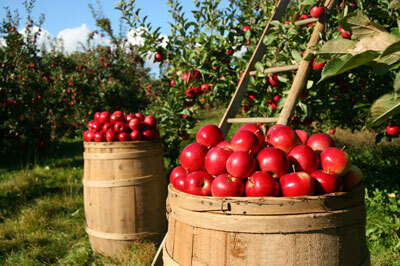 “Like to this apple seed is all the teaching I have given and shall give to you. 4. Like to the full apple is all the knowledge relative to your sphere of being, 5. Like to all the other apples of the tree is the knowledge relative to all the numberless spheres. 6. But behind these spheres lies a deeper reality; changeless, beyond the impermanent flux of time. 7. For even as the apple turns from bud to bloom, from blossom to the fruit, ripens, matures, decays and is reborn; 8. so also shall the spheres and galaxies, the subtle realms, the sure and solid earth; so shall all these in their season pass away, and in their season be reborn again. 9. Thus has it been ten thousand times before, and countless times again, thus shall it be. The Sacred Season of Fall. Season of the Celestial Mother as the Apple of Wisdom. Jana: Madria Thema. Element: Earth. Elemental Color: Green. Liturgical colors: Blue and Purple. Direction: West. Time of Day: Twilight. Mystery: Our Lady, Apple of Wisdom. 1 Abalon/Sept. 5- The Feast of Madria Thema. 17 Abalon/Sept. 21- Mabon: Harvest Festival. Ourania: (Meaning Heavenly, Cosmic: in this case meaning Cosmic Order): Oct. 3 – Oct. 30. Shimovane: (Older form of Samhain meaning Summer’s End. ): Oct. 31- Nov. 22. 1 Shimovane: Samhain: Feast of the Dead. Jana: Madria Thema, which means, Queen and also Divine and natural Law, Order and Harmony. Virtues: Order, Harmony and Justice. She is of the four-fold Earth and is Guardian of West and Earth. Color of Robes: Blue and purple. Mantra: O, Madria Thema, Jana of Order, Harmony and Justice, be with us.